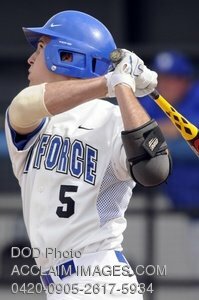 Description: Air Force Academy sophomore outfielder Nathan Carter belts one out of the park during the two-game series with the University of New Mexico Lobos May 15 at Falcon Field. The Falcons lost both games, and finished the season with a 14-37 overall record. (U.S. Air Force photo/Mike Kaplan). Stock photography by Department of Defense Public Domain.